Arriving in Brussels, she said that she had "personal regret" over her request to delay Brexit, but said it will allow time for MPs to make a "final choice". At the EU summit the PM spoke to the other 27 leaders to try to get their backing for a delay beyond 29 March. Meanwhile, Jeremy Corbyn said his talks in Brussels were "very constructive". BBC Brussels correspondent Adam Fleming said Mrs May spoke to EU leaders for 90 minutes and was asked several times what her contingency plans were if she lost the third "meaningful vote" on her deal in Parliament. French President Emmanuel Macron has warned that if MPs vote down Mrs May's EU withdrawal agreement next week, the UK will leave without a deal. "In the case of a negative British vote then we'd be heading to a no deal. We all know it. And it's essential to be clear in these days and moments," said Mr Macron, as he arrived at the summit. "We have done our best, now the solution is in London," he said. On her arrival in Brussels, Mrs May said: "A short extension gives us that opportunity to decide to leave the European Union, to deliver on that result of that referendum and I sincerely hope that will be with a negotiated deal." Earlier, speaking in the German Parliament, Angela Merkel said the EU could meet Mrs May's request to delay Brexit if in the next week there was a "positive vote" on the withdrawal agreement in the UK Parliament. The German Chancellor said European elections at the end of May would have to be considered during discussions on the suggested extension deadline of 30 June, adding: "But of course we can certainly talk about a short term extension." Beware the reports of "huge" differences between EU leaders when it comes to a Brexit delay and the way forward in the coming days. Take Germany's Angela Merkel and France's Emmanuel Macron: there are big differences in their political styles. And big differences in the message they want to send their own domestic audiences (tough for France; open for Germany) when talking about Brexit. But like most EU leaders - irritation, frustration and Brexit fatigue aside - they would rather avoid a costly no-deal Brexit. Chancellor Merkel, like European Council President Donald Tusk has announced she will work "until the last hours" to try to avoid it. And while EU leaders have ruled out re-opening the Brexit withdrawal agreement and the "backstop" text, you can bet they'll discuss a longer Brexit delay at their summit today. They will also discuss the short delay requested by Theresa May, in case - as the EU fears - chaos and division continue next week in Westminster. The UK is set to leave the EU next Friday unless the law is changed. The current default position for leaving is without a withdrawal agreement. Mrs May agreed a deal with the EU, but MPs have rejected it twice. She has asked the EU for a short extension of the two-year Brexit process until 30 June, but any extension needs to be agreed to by all EU members. European Council President Donald Tusk said he believed the EU would agree to a short extension, but this would only be if Mrs May's deal is signed off by MPs next week. Another EU summit next week could be called in an emergency if needed, he said. Mr Tusk said the "question remains open" as to how long a delay the other EU leaders would support. Taoiseach (Irish PM) Leo Varadkar said that he appreciated the situation in London was "somewhat chaotic" and for that reason "we need to cut the entire British establishment a little bit of slack on this". He said there was "openness to an extension" as "nobody wants no deal". 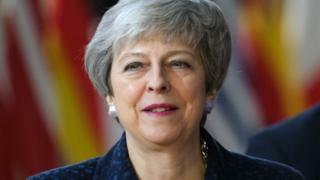 In her speech from Number 10 on Wednesday evening, Mrs May insisted she would not be willing to postpone Brexit any further than 30 June, despite appeals from some MPs. She added: "Of this I am absolutely sure. You, the public, have had enough. "You are tired of the infighting, tired of the political games and the arcane procedural rows, tired of MPs talking about nothing else but Brexit when you have real concerns about our children's schools, our National Health Service, knife crime. "You want this stage of the Brexit process to be over and done with. I agree. I am on your side." She said it was now up to MPs to decide whether they wanted to leave with her deal, no deal or not to leave at all. But she warned that the latter option could cause "irreparable damage to public trust" in politicians. 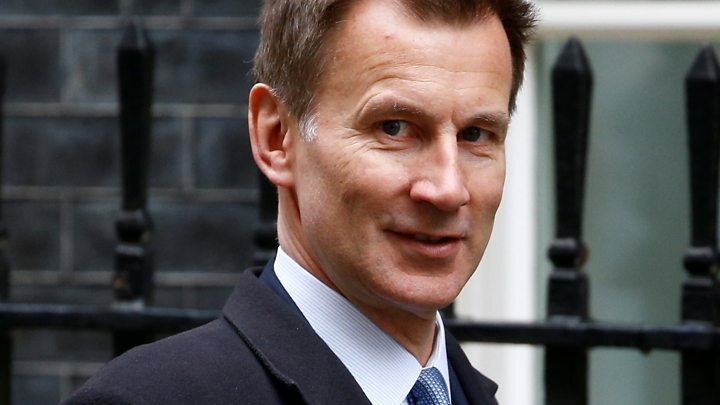 Foreign Secretary Jeremy Hunt said the UK would be faced with three options if Mrs May's deal was defeated again next week: revoke Article 50; leave without a deal; or a longer extension could be granted at an emergency EU summit, but with "onerous conditions". "The choice that we have now is one of resolving this issue or extreme unpredictability," Mr Hunt told BBC Radio 4's Today programme. He also defended the prime minister's statement, saying Mrs May was under "extraordinary pressure" and MPs have a "special responsibility" in a hung Parliament. Many MPs have expressed anger at Mrs May's comments, with Conservative MP Nicky Morgan telling the BBC's World at One they were "terribly misjudged". Fellow Tory Ben Bradley, who had backed Mrs May's deal, said they were "not helpful". Meanwhile, union and business leaders have written a joint letter to Mrs May urging her to "change course" in her approach to Brexit, saying the UK is facing a "national emergency". TUC general secretary Frances O'Grady and CBI director general Carolyn Fairbairn have requested a meeting to discuss their concerns. They said: "Our country is facing a national emergency. Decisions of recent days have caused the risk of no deal to soar. "Firms and communities across the UK are not ready for this outcome. The shock to our economy would be felt by generations to come." Labour leader Jeremy Corbyn said talks with EU Brexit negotiator Michel Barnier and European Commission secretary general Martin Selmayr in Brussels were "very constructive". "Our determination is to prevent a no-deal exit from the European Union next Friday," he said. "We are therefore looking for alternatives and building a majority in Parliament that can agree on a future constructive economic relationship with the European Union." He said he had been "reaching out" to colleagues from all parties in Parliament on this.